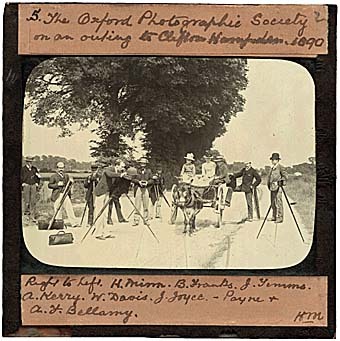 Lantern slide made from a dry-plate negative showing an outing of the Oxford Photographic Society in 1890. Henry Minn's caption gives the names of the participants from right to left - in fact this refers to viewing the image from the other side in the magic lantern. The image forms the title-piece of the exhibition (see Item 1). Wet-collodion positive glass lantern slide 85 x 85 mm printed from a dry-plate negative.